If you've been following the Serial Podcast and its aftermath, you know the central role that Debbie played in the early stages of the investigation into the death of Hae Min Lee. Debbie was a mutual friend of both Hae and Adnan Syed, Hae's ex-boyfriend who was eventually convicted of murdering her. Debbie gave an initial statement to police on January 28, 1999, in which she stated that she remembered talking to Hae at about 3:00 P.M. on January 13, 1999, with Hae saying that she was going to see her new boyfriend Don at the mall. Later, on March 26, 1999, Debbie gave a second police statement, in which she claimed that, on January 13, 1999, (1) she saw Adnan at the guidance counselor's office at "about 2:45;" and (2) she saw Hae between 2:45 and 3:15 in the lobby at Woodlawn High School. 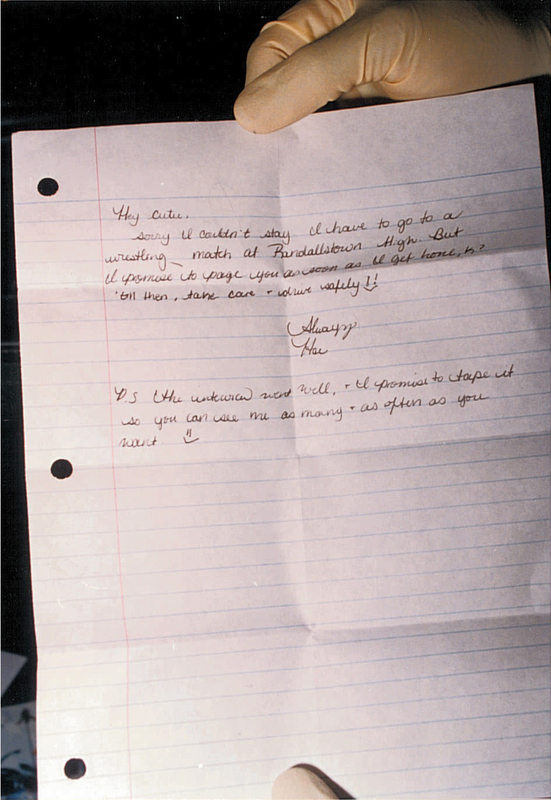 In the early days of the investigation into Hae's death, Debbie was implicitly presented to the public as the last person who saw Hae alive. Here's the article about Hae going missing, here's the article about Hae's body being found, and here's the article about Adnan being charged. All of them list Hae as being last seen at about 3:00 P.M. at Woodlawn, with Debbie clearly being the unnamed "last person" to see her alive. It turns out, however, that, according to Debbie herself, there was a second "last person" to see Hae alive, and she might just be the key to cracking this case, from both a legal and factual perspective. You can check out page 30 of Debbie's 3/26 police statement on Split the Moon. On that page, Debbie remembers seeing Hae in the Woodlawn lobby between 2:45 and 3:15 on January 13, 1999, the day that Hae disappeared. According to Debbie, Hae "was on her way to go somewhere else. To pick up her cousin cause there was a game that day um, he were rustling the basketball, but she was going to the junior um. I think it was at another school not at Woodlawn." This, of course, prompts the obvious question: Who is Takera? I have some leads, but I'm not sure whether any of them will pan out. "Takera" seems to have been (1) a student at Woodlawn High School in 1999, (2) a friend of both Hae and Debbie, and (3) someone who had a boyfriend in January 1999. If any Woodlawn alumni are reading this post and have any insights, I'd love to hear them. Maybe Debbie or someone who knows Debbie is reading this and could provide some input. Why is "Takera" possibly so important to this case? This is complete speculation, but I'm guessing that the police interviewed "Takera." Wouldn't that be the logical thing to do? The police clearly believed that Debbie was the last person to see Hae alive. Debbie herself mentioned a second person who concurrently saw Hae between 2:45 and 3:15. If you're the Baltimore police, you find and interview that person, right? "Takera" could have a better recall of the conversation with Hae. She could remember Hae saying something about giving Adnan a ride. Given that "Takera" was trying to bum a ride, she could have followed Hae to the parking lot to try to get a ride from someone else and seen Adnan in or around Hae's Sentra. She could make the State's case. On the other hand, "Takera" could break the State's case. For example, if "Takera" did follow Hae to her Sentra, she could have seen Hae drive away from Woodlawn with nobody else in her Sentra or with someone other than Adnan. If you're the State, you know that defense counsel will get a copy of Debbie's statement, and you know that a defense attorney worth her salt would try to find and interview "Takera," right? And, as a result, you'd want to talk with her first, right? If defense counsel did find and interview "Takera," imagine the effect it could have had on Adnan's trial if she simply testified consistent with what Debbie said. While the police initially reported that Hae was last seen at 3:00, the State's theory of the case at trial was that Adnan got a ride from Hae soon after school and had killed her by 2:36. If Debbie's recollection was accurate, "Takera" could have testified that she asked Hae for a ride between 2:45 and 3:15 and was turned down because Hae had to pick up her cousin and had no time to give a ride. Would that have been enough to create reasonable doubt? There's no way to know because there's seemingly no mention of a "Takera" or anyone with a similar sounding name in either the State or defense files outside of Debbie's interview. This means that, if someone from the State did interview "Takera," this fact was ostensibly not disclosed to the defense. Assume that Adnan's team tracks "Takera" down, confirms that she talked to police, and confirms that the statement she gave tended to exculpate Adnan. In that case, Adnan could now claim that there was a Brady violation because the State failed to disclose material exculpatory evidence, i.e., evidence that creates a reasonable probability that there would have been a different outcome at trial if it were timely disclosed. Again, "Takera" simply giving a statement to police that corroborated Debbie's statement would probably suffice. Of course, it's possible that "Takera" is contacted and remembers nothing (helpful) about January 13, 1999. It's also possible that the State and the defense never contacted "Takera." If that's the case, there's probably a good argument that Adnan's trial counsel was ineffective in failing to contact her, but a claim of ineffective assistance in connection with Debbie and her statement(s) has already been raised and rejected. In other words, this would be another case of the State avoiding "bad evidence" and defense counsel avoiding "good evidence," and us knowing a lot less about this case than we should. It seems like almost everyone has to fall into one of three camps with regard to the events of January 13, 1999. First, some must believe the initial narrative that Woodlawn had an away wrestling match on January 13th, meaning that they believe some combination of the narratives by Inez, Summer, and Debbie. 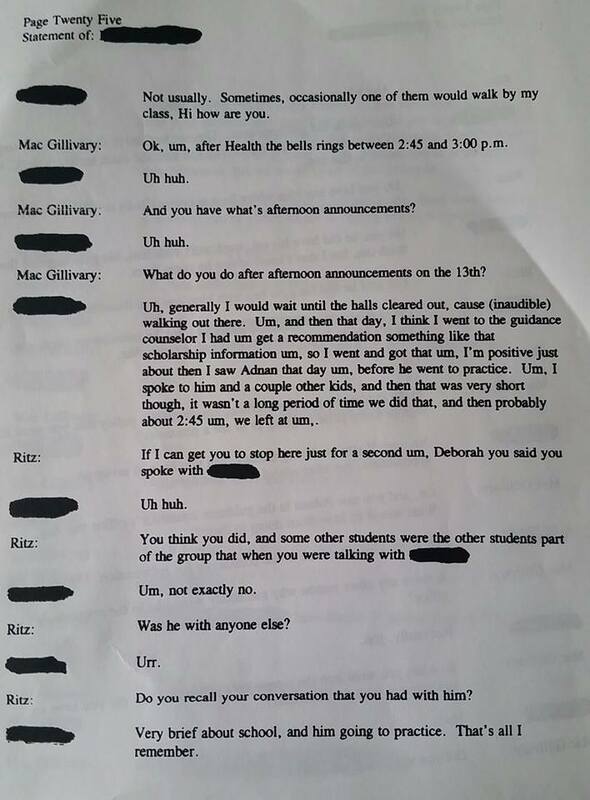 Under this narrative, Hae either left Woodlawn earlier (2:20-2:30 or so according to Inez) or later (2:45-3:15 according to Summer and Debbie), with the plan to pick up her cousin and then either return to Woodlawn to catch the bus to the wrestling match or drive directly to the wrestling match, possibly with a trip to the mall to drop off a note to Don in between. Second, some must believe that there was no Woodlawn wrestling match on January 13th, meaning that they doubt Inez, Summer, and Debbie* and believe some combination of the narratives by Becky, Aisha, and Krista. Under this narrative, Hae (a) left Woodlawn soon after school (2:20ish according to Becky) because she had somewhere to be; and/or (b) told Adnan that she couldn't give him a ride because something came up and she had "something else" to do. Third, some must believe that each of the above witnesses have the wrong day or are conflating several different days. Or, they could believe that we can harmonize certain statements by various witnesses. 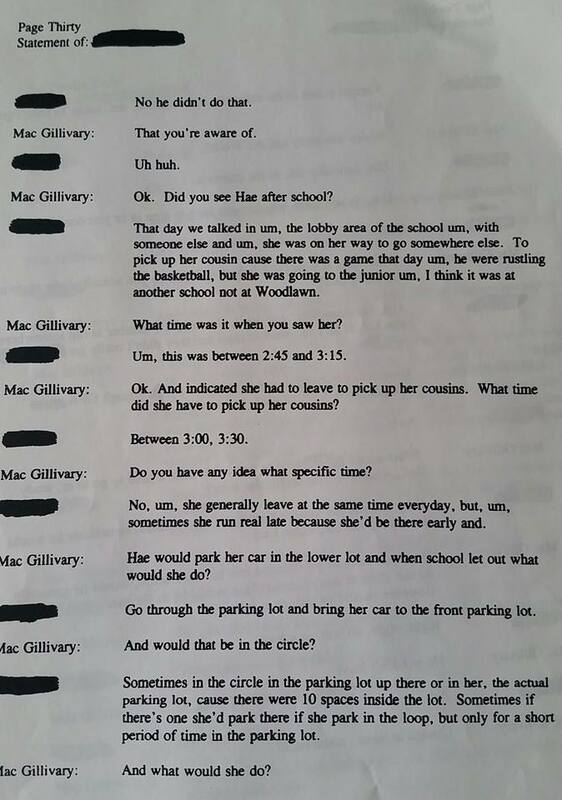 For instance, you might believe that Hae told Becky at 2:20ish that she had somewhere to be as she headed to her car but then got detained while talking to Inez, Summer, and Debbie, meaning that she left later. If, like me, you fall in the second camp, you're trying to figure what came up for Hae that caused her to turn Adnan down for a ride because she had "somewhere to be" and "something else" to do. And you're also trying to figure out whether Hae died while doing this "something else" or whether Adnan convinced Hae to change her mind about the ride and killed her. If you fall in either the first or third camps, it's possible/probable that Debbie talked to Hae on January 13th. In turn, this means it's possible/probable that (1) "Takera" also talked to Hae; (2) Hae turned "Takera" down for a ride because she was about to pick up her cousin and didn't have time to give a ride; and (3) Hae made no mention of giving a ride to Adnan. Moreover, according to Debbie, this conversation occurred right around the time when Hae generally had to leave to pick up her cousin. If Debbie was right, does Hae's conversation with "Takera" exonerate Adnan? Of course not. Adnan still could have convinced Hae to give him a ride after this conversation. But the conversation is fairly strong circumstantial evidence that Hae had no intention of giving Adnan or anyone a ride as she was about to depart at a time when she would have needed to go directly to pick up her cousin. ** Moreover, if "Takera" remembers more about the conversation and/or followed Hae to her car, she might have additional information that could further prove Adnan's innocence (or guilt). Or she could remember nothing. Or she could confirm for us that Debbie had the wrong day. In any event, I hope that "Takera" is located and can tell us what she does, and doesn't, know. *Technically, Debbie doesn't cite a wrestling match, but she does seemingly mention Hae attending some type of sporting event at another school. Therefore, it's possible that Debbie has the right day even if there was no Woodlawn wrestling match on January 13, 1999. After all, if there was no wrestling match on January 13th, Hae had a gap between dropping off her cousin at approximately 3:30 and starting work at LensCrafters at 6:00. It's possible she was going to some sporting event at some point during those 2.5 hours. **If Debbie is right, and Hae had no time to do anything before picking up her cousin, what does this suggest? Maybe Hae had car trouble that landed her in deeper trouble. Is this plausible? We do know that Hae's Sentra was missing its ignition collar, possibly had a broken windshield wiper lever and/or turn lever, and was released to the custody of a body shop. And while it's possible that Hae's Sentra was sent to the body shop due solely to issues that arose during or after her murder, it's also possible that one of these problems caused her to pull over before picking up her cousin. Are you still in contact with Krista? Does she remember Takera? Why do you cut the interview off after MacGillivary asks "Why would Adnan be in the car with her?" Another "mysterious witness for the defense" hail-Mary from the Free Adnan Brigade? Why not post the full interview? Seems strange to have you analyze one page. Do you know that Takera is not mentioned on any other page? Also, what's the discussion that follows at the end of this page? Looks like it's going in an interesting direction. Virtually every aspect of this case screams malfeasance by the prosecution. Why should this be any different. SmarchHare: Krista gave me names that were somewhat similar but could not find/does not remember a "Takera." Seamus & Johan: I can't post the full interview because it needs to be redacted. These pages are the only ones in which "Takera" is mentioned. I will add the next page, where Debbie responds in the same way as Becky to the question about Adnan getting rides. So Debbie remembers her wearing jeans and not the skirt she was found in? In the Third Camp here. Fascinating that there is no record of “Takera” having been interviewed to corroborate Debbie’s statements—seems the police weren’t keen on leaving a paper trail, or just completely lazy. If Takera is located, I doubt the details of that day, in all probability, unremarkable for her, would be available 15 yrs later. If “Takera” had seen HML leaving with Adnan and/or with someone else, wouldn’t this news have been all over the school when Hae was reported as murdered a mere six weeks later? Wouldn’t “Takera” say, “Hey, Debbie. I saw Hae leaving with XYZ that day?” But if Takera happened to glimpse HML leaving alone, it’s doubtful if it even registered with her on the day—let alone 15 years hence. I doubt that "Takera" remembers January 13th, but I bet that she remembers talking to police if she did in fact talk to police. What's left to be redacted? You've got Debbie's last name right there. You've posted Don's. Cathy's real name shows up in the transcripts posted. You have no trouble posting a very unique first name here and even implore people to find this person. What things are left to be protected? monstimal: As you say, Cathy's real name is already out there. The last names for Don and Debbie were both out there before I posted documents that contained them. But there are other complete names in Debbie's interview that haven't been mentioned yet. I posted this post asking for information about "Takera" precisely because it seems like "Takera" isn't the person's real name. Hi Colin, could you post the entire police interview of Debbie? There is an awful lot of speculation as to what was in that interview and who assaulted her. Walter: It needs to be redacted. As an example, I'm pretty sure I just found another portion of the interview in which the actual name of "Takera" is listed. And no, her real name is not Takera. Just wanted to say thank you for your continued, thoughtful analysis. Intriguing. Why would it be recorded as such in the transcript if that's not her real name? Is there any evidence that she was, in fact, interviewed? streetwriter: I'm guessing that it was just a (serious) transcription error. We have nothing to prove that she was interviewed, but there are definitely things in Debbie's statement that make me think that she was in fact interviewed. We'll see what happens. A simple google search turns up several Takeras currently in the Baltimore area, at least one of which is the correct age to have been in high school during the relevant timeframe. Are you sure Takers is not the person's real name? MMR: I'm about 99% sure that Takera isn't her real name. Does anyone else feel the "Adnan is guilty without a doubt" crowd is getting more and more nervous? I mean, when instead of simply addressing the revelation of your investigations, they want to accuse you of intentionally withholding information from them, their point of view is sort of exposed. The obvious question is, What did Takera know?, not what was the rest of Debbie's answer, for crying out loud. Of course, since the prosecution under Urick had a department-wide policy to NOT write things down unless absolutely necessary, so that they would not be bound to give the defense any information they found, this seems likely to be a result of that mischief. I am pretty sure Colin doesn't have the same policy, Seamus. I'm not sure if this point has been made, but Debbie is attributed as saying "he were rustling the basketball" in "To pick up her cousin cause there was a game that day um, he were rustling the basketball, but she was going to the junior um. I think it was at another school not at Woodlawn." Should we read this as "either wrestling or basketball"? Was there resolution on the question of junior varsity teams for either wrestling or basketball, given that Debbie specifically mentions "junior"? Nine9fifty: "rustling" certainly could be wrestling. So, Debbie seems to be saying Hae was going to a sporting event at another school, possibly a JV sporting event, and possibly a (senior or JV) basketball or wrestling event. Woodlawn's yearbook for 1999 does not list a JV wrestling team. Incredibly interesting find here. I do hope that this Takera was talked to by the police, because if not then it was in all likelihood just a normal January 13th for her and she would not recall much after all this time. Just a thought, but I believe Debbie's potential memory of "either wrestling or basketball" could be significant, since someone also brought up that Stephanie may have been attending or playing in a basketball match that afternoon? And since we don't have much information about when Jay and Stephanie may have met up for her birthday, perhaps that's one event that might place those three people in the same location at some point that day? Seems like there actually was a Takera at Woodlawn, Class of '99, and according to google she still lives in the area. What makes you believe it's not her real name? Carolin: That's a fake listing. Episode Four of "The Case Against Adnan Syed": Did the Idea of Best Buy Come From the Police?